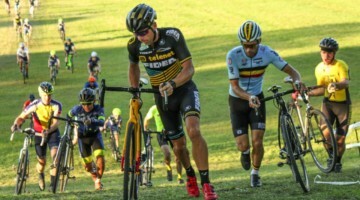 At 34 years of age, Sven Nys only has one elite World title among his palmares, but with seven Belgian Championships, nine Superprestige titles, seven GvA Trofee titles and six World Cup overall wins, he’s the undisputed king of ’cross in Belgium. And as a member of the UCI’s Cyclocross Commission and an athlete with more than 25 years of experience in cycling, his knowledge of the sport is unparalleled. Dan Seaton of Cyclocross Magazine sat down with Nys in his personal trailer before the Monday night Superprestige race in Diegem, Belgium, and put your questions to the Belgian superstar in the first of our Ask a Pro series. Stay tuned as we’ll be following this up with interviews of other top-level members of the cyclocross peloton, and we’ll be collecting your questions and giving you a chance to interact with the best in the sport. Cyclocross Magazine: How much do you attribute your success in cyclocross to your previous experience in BMX? Would you encourage kids to race BMX at an early age instead of cyclocross if they aim to do well in ’cross later in life? Sven Nys: Yeah. Of course. BMX was for me the most important, the start of my career. All my technical skills come from BMX. You start from a young age in sport with your bike, you learn to lose, learn to win, learn to have an explosive start, technical skills—everything is coming to a high level when you do BMX. So for me, it’s really important. CXM: What do you think the next breakthrough in equipment will be for ’cross? 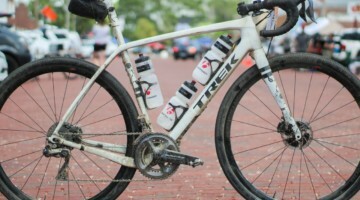 CXM: And what do you think about disc brakes? Nys: For me, I’m used to them from the mountain bike, but it’s something new for cyclocross. 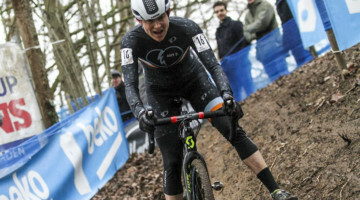 There are some dangerous downhills like [in the Zolder World Cup], and when you have disc brakes, you have a little bit more control over your bike. So in the future, when it’s possible, when the bikes are ready, and when Shimano and SRAM are ready, I think we’re going to race with disc brakes. It’s getting cyclocross to a higher level. We can brake a little bit later and have a little bit more control over our bikes, so for me it’s important that we can support this new rule. CXM: And what are your thoughts on the development of technology for ’cross? Some people would like everybody to race on the same, classic setup forever, but others embrace new technology? Nys: I’m ready for something new, and when you only do what is classic, the sport can’t develop to a higher level. I think it’s really important that we, in our small sport, also develop the material and do everything we can to support some things like this. CXM: What are your thoughts about cyclocross in the Olympics? Are you at all involved in that process? Nys: I support it, of course! It’s the only reason why cyclocross is now so small: because it’s not an Olympic sport. Mountain biking is a much younger sport, but it’s much bigger because we have a lot of interest from other countries and other riders [because of the Olympics]. Most of the riders here [in cyclocross] are from Belgium or Holland or the Czech Republic. So for us it would be really good if it were an Olympic sport. But it’s not so easy, because normally they say when it’s a winter sport, it must be done on snow and ice. Of course, we can do that – everybody saw that it’s possible [in Zolder and Kalmthout]. So maybe it will happen in the future, and I’m going to support it. CXM: So many people put everything on getting the lead right at the beginning of the race, yet we’ve seen you come from far behind to win many races. Is your goal to be at the front on the first lap of every race? Nys: Of course, it’s important to have a good start, because then you can wait a little bit to put the power on. When you’re in the back, you must try to go as fast as possible to the front and, of course, that’s not always possible. So the start is important. I want to be in the front, but it’s not always possible, and then you must use your experience and try to overtake the riders where it is possible and not where it’s dangerous. And now I think I have enough experience to win a race in the last lap and not to try to go as fast as possible to the front. CXM: You always seem so calm, poised and in control late in the race, regardless of your position. Are you aware of this? Is it intentional? Strategy perhaps? I find when I stay relaxed, I go faster, and my opponents seem to suffer more. Have you experienced this as well? Nys: Of course, it’s really important to stay relaxed and try to focus on your own feeling and try to win a race the way you like the most. And that’s not stressy, not trying to go to the front really fast, but staying relaxed and doing what you can. But nothing is impossible, so you must try to stay relaxed and that’s the only reason why I win so much. Of course, I’m sitting most of the time in the front, but when you are in the back after a crash or a bad start, you must use your experience and say, ‘When I’m the strongest, I’m going to win.’ And that’s not like in road races. You don’t need a peloton or some teammates; when you are strong, you can win the race, even when you are 30 seconds back. 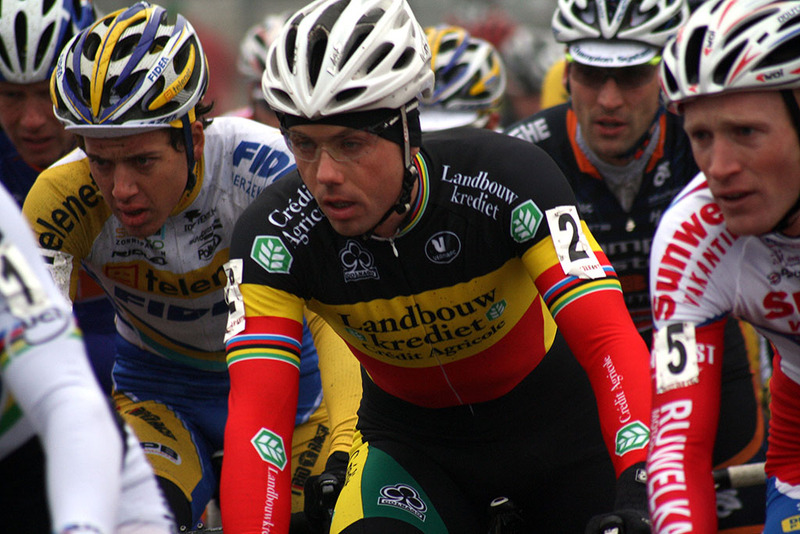 CXM: What role do tactics play into regrouping when you have a big advantage early in a race? How much of what you do is to allow the body to recuperate somewhat before the final push in the last couple of laps? Nys: You always have to stay focused on your own feeling. Never go harder and harder; try to stay relaxed and listen to the announcer and say, ‘Ok, it’s 50 seconds, try to hold it on 50 seconds.’ When they come to 45, try to find a place where you can accelerate, but don’t panic. Just stay focused on your own race. So you must stay focused on your own feeling, and when you have the feeling that you can hold it for a whole race, one hour, then it’s no problem. But when you are riding over the limit just to hold the gap, then it’s really dangerous. So also stay [relaxed] when you have a big gap. CXM: You are regarded as perhaps the best cyclocross bike handler racing today. Do you do any specific practice drills or exercises for bike handling, or do you just incorporate skills into your general training? Nys: For me it’s important that I train a lot in the woods, to have a good feeling on the bike, with the tires – and the pressure in the tires – and practice just staying relaxed on the bike. And when you train a lot in the woods, you have that good feeling, and that’s most important. But of course, it’s road training and cyclocross training and running, and everything together makes a good cyclocross rider. CXM: How do you structure your training program from August until the middle of the season? Do you do intervals? What type of training do you focus on and when? Nys: In the beginning, when I’m starting the preparation for my season, after the beginning of April, it’s a lot of endurance, because you must try to have a big engine. And then come the road races, the mountain bike races – that’s intervals enough in summer. I try to also ride in the summer on the cyclocross bike, and to have that feeling again all season, all year. It’s important. When the cyclocross season comes a little closer, then it’s important to have interval training, training for running. Most of the time it’s maximum two times in a week that I do cyclocross training or interval training. And that’s important, that you can have a good conversation with your coach and say now we do something because it’s going down, or it’s going up and we should train a little harder. It’s a feeling that you must have, and experience is important also. CXM: Have you changed your training in order to keep up with the younger racers like Stybar and Albert? What have you done differently this year physically, mentally and equipment-wise, if anything? Nys: Nothing. For me it’s 15 years the same. Of course, I do other races on the road for my preparation for cyclocross, and of course I’m getting stronger and stronger because I’m doing mountain bike races. So that’s the most important change there is in the last five years, that I do mountain bike races now, when before it was only road races. I’m getting a little bit older, but also stronger, and the only thing that’s not so good as when I was 24 or 25 is my [top-end] speed. And then it’s important to train behind the motorbike or riding in a peloton. 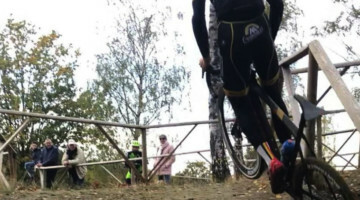 CXM: What do you see as the difference between cyclocross in the US and in Europe? What is each side lacking? Nys: For me, that’s also a big question, because I never saw a cyclocross race in the US. But I see there are a few riders who can stay here in the top 20 in the World Cups, and they’re learning a lot and bringing it over to the US. So they’re learning a lot of cyclocross. And we have internet now, and we can see everything on PC, so that’s an important way to learn a lot. But the organization and everything around cyclocross in the US, it’s a big question for me. 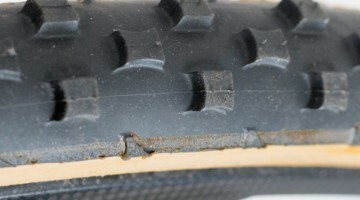 CXM: What’s the best tire to use in snowy or icy conditions? Nys: It changes a lot, because snow is not always the same. It can be frozen, sometimes there’s a lot of water in the snow like [in Zolder]. So you can’t say, ‘This tire is really good for snow.’ Today [in Diegem] there is a lot of road in the cyclocross race, so then we use the normal tires. Sometimes it’s a Rhino, like [in Zolder], but when it’s really frozen and it’s really icy, then it’s important to use the Pipistrello – the white ones. So it’s every time another choice and thinking about what is best. CXM: How do you decide? Nys: You train on the track and decide before the race. CXM: And what about the pressure? Nys: The pressure is even more important than the tire, because if it’s too hard you can slip away, when it’s too soft you can have a flat tire. So it’s really important and it’s a lot of stress. CXM: What will you do when you retire? Will you coach? Start your own team? Motocross? Nys: [Laughs] I don’t know! For me it’s also a big question. I’m really interested in doing some coaching and doing something in the organization of some teams maybe, or the GvA series, so we’ll see. But it’s not for this moment – I try to race two or three years, and then we’ll see. This was great! Keep them coming. I wish you asked him when he was going to have his first Delirium Tremens, or Duvel, or Chimay.